Always enjoy Doonesbury, whether old or new. And today enjoyed a new actual Doonesbury -- Alex and Toggle's daughter! Now I have to, like, check out vocal fry. "Speech mannerisms" de-volve, ya know? Yeah, no. Ugh. GBT is at his best when his strips are not "topical" or "current." J.J.'s (mis)adventures as a cabbie will still play decades from now (or maybe not, with the advent of the "self-driving" automobile). One could say that J.J. is pioneering a new kind of "performance art." 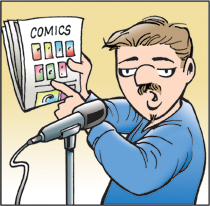 Roland says in his most recent tweet about the "Quebecois cartoonist" (as a Canadian that kills me every time :-) ) that he has lost seven pounds. Using the most recent currency conversion rates that is about $9. With Brexit on the horizon, the pound is likely to lose ground, so I suggest he convert to US$ as soon as possible. J.J.'s adventures as a cabbie are making me laugh. To friends and family I am notorious for getting lost. Some years back, my niece got married in Brooklyn. Thank goodness, the invitation included a map. So my husband told me to take the Brooklyn-Queens Expressway and all would be well. On the way home, I called and he said, "How lost did you get?" "Let's say I explored all four compass points pretty thoroughly." "Mel, cops get lost in Brooklyn." "At one-thirty in the morning, that is not comforting. No one told me to bear right on the BQE as I left the Battery Tunnel. I ended up on the TriBoro Bridge." It was almost worth getting lost to hear my born-and-raised-in-New-York husband say, "Oops." I just want to say that I thoroughly enjoy Doonesbury and have since the first. Keep it up! Oh happy day. All eight strips are on the Flashbacks page! Such a small thing, but it always makes for a good start to my day when they are all there! I wish it happened every day. Glad you enjoy this time-travel feature. There have been a few additional glitches as a result of our site re-launch, but when one of the windows on the Flashbacks page ("Today's strip -- 5,10,15,20,25,30,35,40,45 years ago") does not display a comic it is usually due to one of the sabbaticals GBT has taken over the years. (The first was from January 1983 through September 1984.) Also, although the daily strip launched on October 26, 1970, Sundays did not begin until March 21, 1971. This is outrageous!! It's obvious that Berserkistan is a far more important and far more troublesome and hard-to-work-with country than Turkey or Ukraine. And we know Duke's work in lobbying for Berserkistan would have required far more underhanded business and double-crossing military deals, so the fact that Duke is the only one of the three nominees not currently caught up in serious charges is remarkable and clearly proves he deserves the highest honor, The Dickie. I've never heard the song by "the Travis boy," but I'm familiar with a Canadian's take on the subject. "We got a thousand points of light for the homeless man. We've got a kinder, gentler machine-gun hand." Neil Young's Keep on Rockin' in the Free World. President Bush was referring to Randy Travis's "Point of Light." You can see a live performance, with a glimpse of 41 singing along, here. My blowback is simply this: I think you should get rid of the Blowback section and bring back Today's Video (or This Week's Video, if time constraints won't allow a video every day). Our society is overrun with comment sections and social media posts. Why? All they do is provide more platforms for toxicity. In a more perfect society, perhaps comment sections would elevate to the level of discourse originally envisioned by Tim Berners-Lee. Unfortunately, we are not that society. The video section was awesome; it opened up the world! I would bet good money that folks frequently saw things in those videos that they had never seen or heard before. I know I did. I cannot say the same for Blowback. Roland. Get real, man. You know red lines seldom work even if they are thin. Ya got to follow up on Nancy Pelosi's observation -- the beaded curtain idea. A beaded curtain can be very effective, especially if a huge Punjab-type character stands in front of it. A lot of people are saying. Garry must've really hit a nerve with Sunday's strip, judging by the responses. Keep up the Good Work! p.s. I got a new iPad and can see the Mudline again. Whoo hoo! What the strip gets wrong is the assumption that Americans care about the character of their president. Not so. Americans care about low gas prices and low unemployment. It wouldn't surprise me if Trump gets a second term. It is impossible to satirize Trump, and this is historically a satirical strip. To focus on his faults is like spearfishing in a barrel. My reaction is, "Yeah, so? I can read that in the news pages." There are other disturbing aspects of society which are less scrutinized, and deserve your attention. Sorry, but your strip today about not being Fake News was Fake News. By conveniently omitting that Trump only sleeps about four hours a day and does not consume alcohol or drugs, you obscure the fact that he has four to six more waking hours a day than the average person. He can tan or play golf and still work 12 to 15 hours a day. His many accomplishments in his first two years are a testament to this fact. We have lower unemployment, better trade deals, and a stronger world presence than during the eight years we endured under his predecessor, who did his best to destroy our company. If Donald Trump did not have to constantly fight a biased media, a Democrat-funded federal hypocritical conspiracy investigation, and senatorial opposition, just imagine what he might have accomplished. I do not understand why a man who supports the traditional American values and our federal Constitution is constantly vilified by people who think they know better. Socialism? Which has failed at every attempt. Fundamentally change a country from what has made it the greatest in the history of the world? What is the benefit to leftist and liberals in destroying the goose which laid the golden egg? I don’t think the enlightened, intellectual elite are all that smart. Re: Boopsie and B.D. Huh. I've always thought B.D. is such a jerk. I could never understand why Boopsie stayed with him. Variant conditions and behaviors pertain in the vast and mysterious cartoon universe. Boopsie and B.D. live in Malibu. I came to Doonesbury about 15 years ago during the Iraq War. I always thought Boopsie was such a ditz, and I never understood why B.D. stayed with her. But going back to 1991 and seeing what an absolute jerk B.D. was to Boopsie really p****s me off! Gives me a much different perspective on both characters.